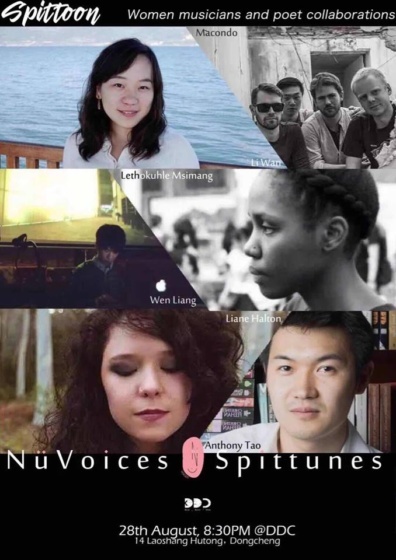 Spittoon and NüVoices are working together to host the next Spittunes event in Beijing on August 28, and I’ve been asked along with Liane Halton to reprise our June performance, which featured two individual poems (Amazing the Ways We Hurt, What Will Save You), two songs, and three collaborative pieces (Zhuangzi Dreams of a Butterfly, Christmas alla Romana, and The Last Tribe on Earth). Liane is a classical guitarist from South Africa (find some of her work here) who I was honored to work with, and I can’t wait to do it again. Other performing artists and poets on August 28 include Macondo, Li Wan, Wen Liang, and Lethukuhle Msimang. 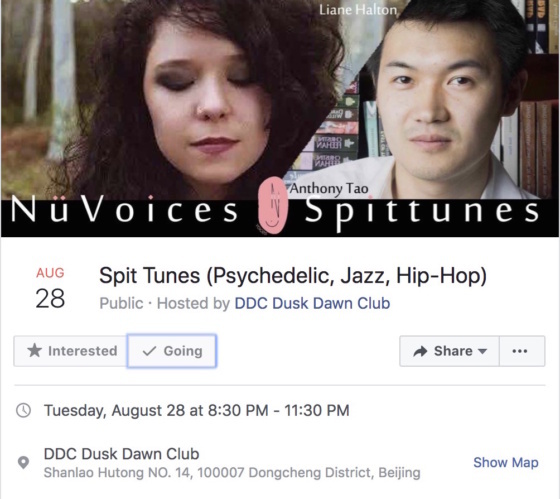 The show starts at 8:30 pm (Tuesday, August 28) at Dusk Dawn Club (DDC —黄昏黎明). Here’s a peek from our June performance. More videos later!